WordPress – one of the most advanced and powerful Content management system. It has immense functions to create any type of blog or website within a matter of time. Millions of blogs are created in WordPress everyday. The most important reason behind popularity of WordPress is you can easily create a blog without having good knowledge of coding language. There are many resources on the internet that can help you create blogs in WordPress in no time such as plugins, themes, widgets, tutorials and much more. Personally, my reason behind using WordPress is thousands of plugins available in the WordPress that allow me to do anything I want in my blog. You name any functionality and there are chances that you find a WordPress plugin for it easily. Though, sometime you have to digg deeply and sometimes you find them easily. This is the reason I came up with a post listing incredible WordPress plugin that are very essential to install to run any WordPress blog of any niche. There are many WordPress plugins out there but I have gathered up best WordPress plugins and rest of them are leave behind without any thought. Some of them you already know while some of them will be new for me but I can assure you that each plugin is unique in its functionality and bring immense power to your blog. So, better hit a jump and look on our collection of 13 best WordPress plugins you should check to install right away. Don’t forget to tell us your favorite plugin in the comments section below. 1. WP Super Cache : This plugin generates static html files from your dynamic WordPress blog. After a html file is generated your webserver will serve that file instead of processing the comparatively heavier and more expensive WordPress PHP scripts. 3. WP – PageNavi : Adds a more advanced paging navigation to your WordPress site. Display counts for social butons like Digg, LinkedIn, Reddit, dDone, Twitter, TweetMeme, Topsy, Yahoo Buzz, facebook share, facebook like, StumbleUpon, Delicious, Sphinn, Google Buzz, Designbump, WebBlend, BlogEngage, Serpd and AddThis. Facebook Like support multiple languages. Left or right scrolling effect like Mashable.com. Supported in Home page. 5. Contact Form 7 : Contact Form 7 can manage multiple contact forms, plus you can customize the form and the mail contents flexibly with simple markup. The form supports Ajax-powered submitting, CAPTCHA, Akismet spam filtering and so on. 6. Ninja Affiliate : Ninja Affiliate is WordPress plugin developed to imbue lethal marketing powers into your WordPress blog and instantly double or triple your affiliate marketing commissions with almost no effort on your part. Using Ninja Affiliate, you can automatically convert any keyword in your blog to an affiliate link instantly. You can also cloak your affiliate links, track them and manage them right from your WordPress text editor. 7. Editorial Calendar : Did you remember to write a post for next Tuesday? What about the Tuesday after that? WordPress doesn’t make it easy to see when your posts are scheduled. The editorial calendar gives you an overview of your blog and when each post will be published. You can drag and drop to move posts, edit posts right in the calendar, and manage your entire blog. 8. WP -DBManager : Allows you to optimize database, repair database, backup database, restore database, delete backup database , drop/empty tables and run selected queries. Supports automatic scheduling of backing up and optimizing of database. 9. SEO Smart Links : SEO Smart Links provides automatic SEO benefits for your site in addition to custom keyword lists, nofollow and much more. 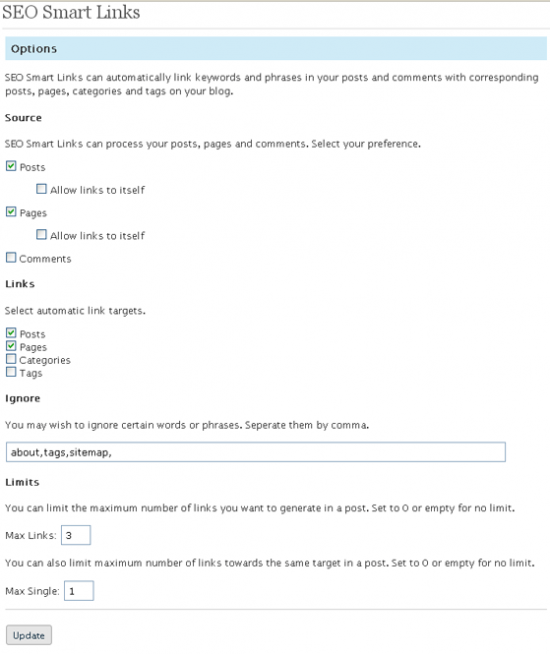 SEO Smart Links can automatically link keywords and phrases in your posts and comments with corresponding posts, pages, categories and tags on your blog. 10. Widget Context : Widget Context allows you to specify widget visibility settings. In simple words, you can easily choose pages and posts in which you want the sidebar widget to appear. The best part which I liked about this plugin is you can easily create different sidebar for different pages and posts. 11. Thanks Me Later : Thank Me Later will automatically send an e-mail to your those who leave a comment at your blog. Use this plugin to say ‘Thanks’ to your visitors, and prompt them to further engage with your blog. TML is highly configurable. It allows you to create multiple e-mail messages and to send the message after a pre-defined amount of time, making messages appear more unique and people-friendly. 12. Feedburner Circulation : Returns a database stored Feedburner Circulation Count in plain text or number format. Reduces the Feedburner API calls by only updating the circulation count hourly and serving a database cached result in between. The account you’re attempting to get a “Circulation Count” from must have the awareness API turned on. 13. Tweet Old Post : Tweet Old Posts is a plugin designed to tweet your older posts to get more traffic. Tweet Old Posts randomly picks your older post based on the interval specified by you. The primary function of this plugin is to promote older blog posts by tweeting about them and getting more traffic.